Light rail trains are running south from downtown to Sea-Tac, tunnel boring machines are making way for light rail north from downtown to the UW, and people can ride Metro and Community Transit bus rapid transit in the east, south and north corridors of the region — it feels good that things are happening to make high capacity transit a reality. Just as important as building the transit infrastructure, the region needs to focus on planning for the areas around new stations – both for stations that will be ready in the next few years as well as for those that won’t open for another 20 years. The region’s transportation plan includes more than $100 billion in transit investments, 68 new miles of light rail, and 80-100% increase in bus service by 2040. Making the most of these investments by creating communities near transit with affordable housing, jobs and compact development – all of the things that support transit ridership – is the goal of Growing Transit Communities, a new effort with many regional partners being led by the Puget Sound Regional Council. Growing Transit Communities is seeking to implement the VISION 2040 regional growth strategy by developing actions at the local level that are hugely important to achieving the region’s growth management plans. In three different corridors, Growing Transit Communities will be working with more than 20 jurisdictions and 50 transit station areas to create action plans for development. In some cases, like in older parts of Seattle and Tacoma, these places already are fairly pedestrian friendly with things close together. 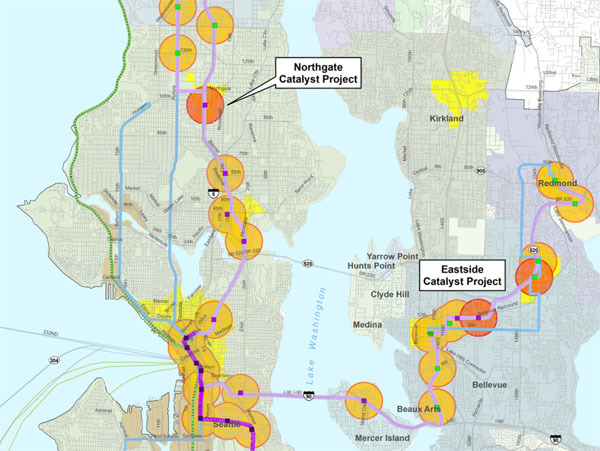 In other areas developed after the streetcar era and very car-focused (Northgate is a great example), cities will have a considerable challenge transforming the area into a place where people of all ages can easily walk to a train or grocery store. Throughout all of this planning, Growing Transit Communities will be working on ways to bring new voices from previously underrepresented groups to the table, and to develop a regional affordable housing strategy aimed at ensuring people of all income levels can actually afford to live in these great new transit neighborhoods. Ben Bakkenta is a bus rider who lives in Capitol Hill and is a program manager at the Puget Sound Regional Council.